You cannot talk about this dish without having drool collect in your mouth. Everybody loves this chutney. 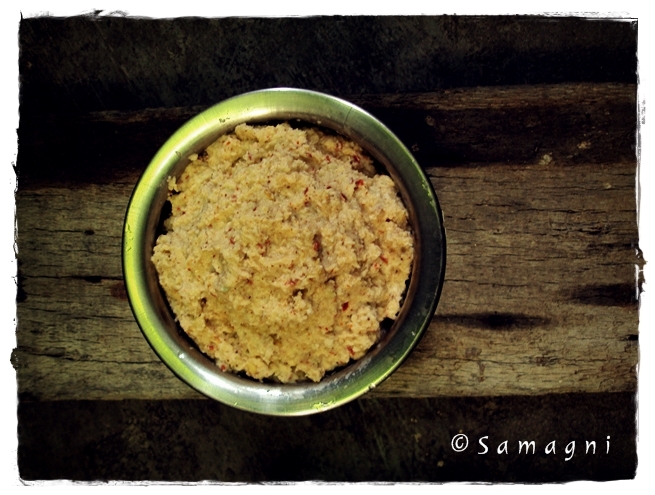 Raw mango chutney is ideally eaten with kanji (rice gruel) or rice, but it can be eaten with dosa or idli also. Best way to make it is on the traditional stone grinder using very little water but you may use a mixer. You can use green chilies instead of dry red chilies. Wash and peel the mango and remove the seed. Chop into small pieces. In a small kadai, dry roast red chilies for 1-2 minutes until the raw smell is gone. Coarsely grind the raw mango pieces and red chilies together in the small jar of the mixer (or traditional stone grinder) without adding water. Add a few drops of water if necessary. When these two ingredients are ground coarsely, add coconut and grind to a coarse paste. Use only very few drops of water just to aid the ingredients to blend together. Serve with rice. No tadka/seasoning is required for this chutney.